Noriday is a contraceptive medicine, commonly known as a progestogen-only" pill or "mini pill". This treatment is typically used by women who are unable to take other types of contraceptive medicines. 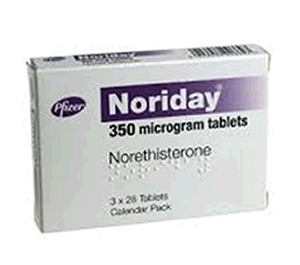 Noriday contains norethisterone which is the main active ingredient and it works in three different ways to prevent pregnancy. Noriday is a hormonal contraceptive which contains the active ingredient norethisterone (which is a synthetic progestogen). Noriday prevents pregnancy in three ways, firstly by causing changes to the mucus of the cervix and the lining of the womb, which stops sperm from being easily able to enter and being able to fertilise an egg. Secondly by changing the womb inner lining to stop any eggs which have managed to have been fertilised from implanting onto it. And thirdly, to prevent eggs from being released from the ovaries in some women, however this does not happen in all cases. When you first take Noriday, you should take it on the first day of your menstrual cycle which ought to protect you immediately from conception. If you start taking it at a different time during your monthly cycle you might have to use other forms of contraception such as barrier protection. You should take Noriday at the same time every day, for it to be most effective at preventing pregnancy. Does taking Noriday prevent me from Sexually Transmitted Infections? How do I order Noriday? For your convenience you can complete a free online consultation with one of our qualified and authorised medical practitioners at UKMedix. If our specialist is satisfied that Noriday is suitable for you they will issue a prescription to you and dispense the medication from our UK Registered Pharmacy for next day delivery.